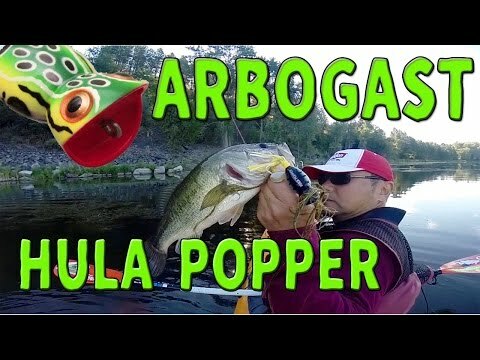 The Arbogast Hula Popper is a true legend in topwater lures. More fish have been caught on the Hula Popper than any other skirted topwater bait. The legendary Arbogast Hula Popper is as deadly on bass, pike and other gamefish today as it was when it first hit the market more than 60 years ago. It’s the pulsating skirt that makes the difference – even during the pause it moves like something alive – a killer action that results in vicious topwater strikes. Can be plunked, popped, twitched, or jerked. The Hula Popper gives every big fish within hearing distance a wake-up call they’ll never forget. Species: Northern Pike, Largemouth Bass, Smallmouth Bass.